We had grilled cheese this afternoon. I'd been waiting for my son to get home on spring break from UNC Chapel Hill to break out the halloom cheese. He's heard me and his brother raving about this cheese and has seen the photos here on Barbecue Master. For anyone who has not tried grilled cheese, I must say that you are missing out. I'd rank grilled cheese right up with high quality chocolate. Yes. It is that good. I'm not even a huge cheese freak. I've never been one to just sit and eat plain cheese. I'd go with crackers with cheese. But . . . not with cheese on the grill. It just melts in my mouth, and I could eat tons of this stuff. 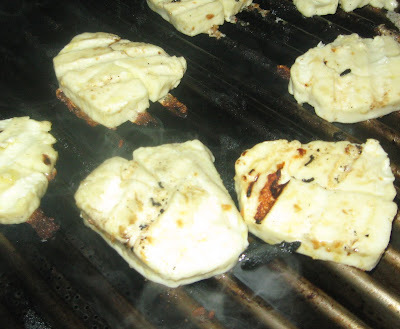 When grilling cheese, you want to marinate or brush it will oil or an oil based product. My favorite oil for grilled cheese is Garlic Gold. The last time I grilled cheese, I used Garlic Gold Oil. 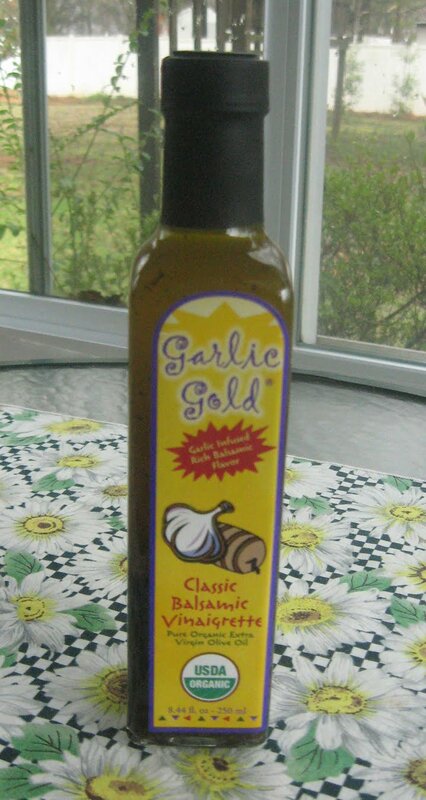 This time, I had a sample bottle they sent of their Garlic Gold Classic Balsamic Vinaigrette. Both worked great. If you're not familiar with the Garlic Gold company, they have a ranch called Seven Oaks Ranch where they grow organic products like their garlic and then create and sell hand crafted garlic nuggets, oils, and vinaigrettes. I fell in love from the first taste, and the company keeps in touch. You really couldn't ask for nicer people, and I like to support great people making great products. 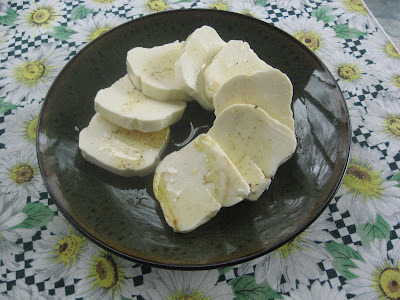 Getting the cheese ready was as simple as pouring some of the Garlic Gold Classic Balsamic Vinaigrette over the cheese. That's as easy a recipe as they come. Since the Garlic Gold oils and vinaigrettes are flavor infused, there's no need to add anything else. You don't, after all, want to overpower the cheese, and the Garlic Gold products are subtle but terrific. I heated up the Char Broil Urban Grill which is a small two burner gas grill that is perfect for my small family. It is important to heat the grates well. So, I put the grill on high and put the lid down. When the temperature gauge hit about 600 degrees F, I opened the lid. After the grill was good and hot, I opened the lid and waited about 5 minutes. You do want the grates hot but don't want a whole lot of heat otherwise. This is cheese after all, so don't go with high grill heat like a steak, or you will have a mess. A couple of my friends had this happen. I'm sure they just had too much heat going with the barbecue cheese. I've never had a fail on grilled cheese (knock on wood). Grilled cheese can also be done over charcoal, and that adds a nice smoked flavor. In that case, do the same as with gas but offset the charcoal. 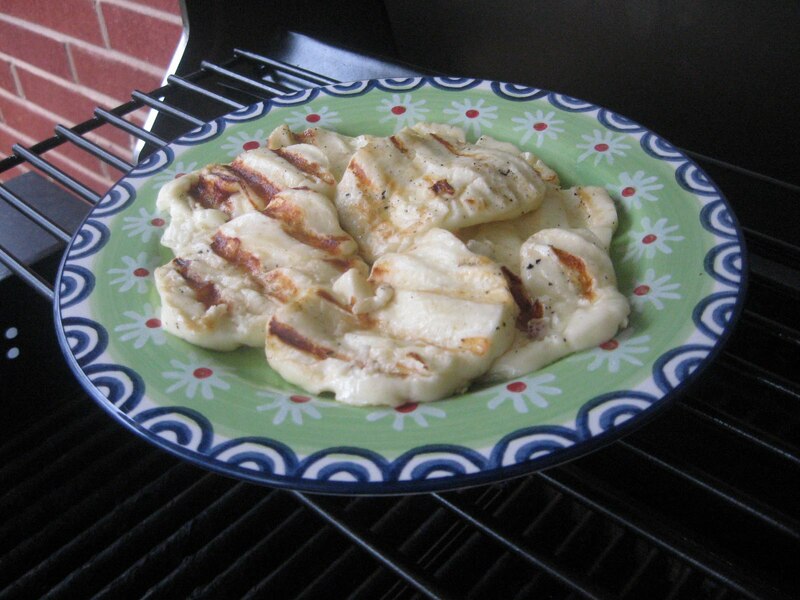 The grate gets hot, but you have the space with no direct heat to actually grill off the cheese. When the cheese starts to look melty (begins to droop slightly between the grates), it's time to turn the cheese. I just use grill tongs. The cheese holds together just fine. 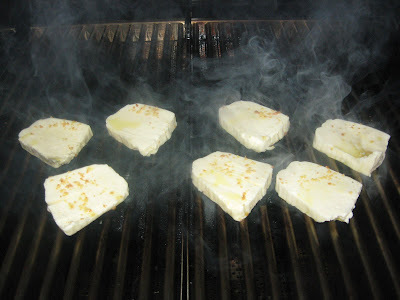 Grilling cheese only takes a few minutes. I think I went around 6 minutes today with the lid closed part of the time due to the low temperatures outside. Brrrr. On warmer days, I may or may not close the lid. I don't leave the lid closed for long (maybe a minute), because I don't want to melt the cheese through the grates. So, this is a really simple grilled dish but one that you want to watch close. My son from college thought the grilled cheese was fabulous, and he's going to pick up more at Whole Foods in Chapel Hill. I can't buy grilling cheese around here. I'm hoping Harris Teeter will start carrying it, because we sure do love it. What a fantastic idea...but how about clean up? I have visions of melted cheese sticking to everything. Where do you get this kind of cheese? A regular grocery store or special cheese shop? Do you place it on grilled bread then? My mouth is watering. Great pictures!! Hi J Q - Very little sticks. Just what you see in the last photo. I close the lid when we're eating and the cheese just kind of crisps up and then is real easy to scrap off. This is a whole lot easier than cleaning up after foods with barbecue sauce. Whole foods has the high heat cheese. We don't have one here. That's why I'll have to get my son in college to bring it in next time. I'm sure other specialty stores carry this or similar, but the most upscale food store we have is Harris Teeter, and they didn't have it when I checked. We just pick it up with our fingers like an appetizer. It is warm and kind of melty but not sticky. It's easy to eat as a finger food. Though I usually like to balance out cheese flavors with something else, in this case, it's so delicious that I don't want anything between me and that grilled cheese taste.